Who matters and who doesn't? The answer depends upon what you believe. I recently gave a talk at United Theological Seminary on United Methodist Beliefs. The following constitutes part of the introduction to that talk. I welcome your comments, questions, agreements, and disagreements. Imagine you have before you two people: The first is 35 years old, an up and coming scientist with an impressive c.v. and an IQ in the top two percent of all people alive today. This person was born and lives in the United States, votes, pays her taxes, and is politically active. She has made considerable contributions in her field, gives public lectures on interesting topics, makes lots of money, gives some of it to Greenpeace and some to Habitat for Humanity, and is generally considered the envy of all who know her. The second person was born and lives in Nicaragua. He is 55 years old. For reasons unknown, he never developed intellectually past the age of eighteen months. He is at the constant mercy of his caregivers and is utterly dependent upon them. He has no chance at schooling, a career, marriage, or children. He lives in conditions of poverty, and draws upon precious community resources without contributing back into the community’s economy. Is one of these people more valuable than the other? Now, if you are a person of faith, I’m going to take it that you know that the answer should be “no.” But do you know why the answer should be “no"? You see, there are many people today who will say “yes.” They might not say it out loud, but they would think it nonetheless. They rate human value based upon utility. People are valued because of what they can do, what they can contribute to society. This way of viewing people, of course, depends upon some idea, normally unexamined, of what constitutes a contribution. Now we’re beginning to talk about human beings in a different, and very particular, way. We’re talking about human beings in light of the set of claims we make about God, about God’s action in the world, God’s sacrifice for us on the cross, and the resurrection of Jesus Christ from the dead. In other words, our thoughts about who and what human beings are take place within a broader network of theological claims. So how we think about God comes to bear on the ways in which we think about people, which, in turn shapes how we think about human relationships, the use of money, various political issues, who matters, and who, if anyone, does not. We all have a way of looking at the world, but not all ways of looking at the world are equally virtuous. Not all ways of looking at the world are equally true. And I’m convinced that the most virtuous and truest way of looking at the world is through the lens of the creedal faith of the church. The Holy Trinity brought all things into being, created humankind, mourned our rebellion, became incarnate in Jesus Christ, taught us how to live, bore the sins of the world on the cross, rose bodily from the dead, and will come again in glory. That narrative—if you internalize it—will shape the way you view everything. Jason Vickers asks some interesting questions about the need for those within the church and religious academy who resist the prevalent culture. Check out his blog here. Jason Vickers of United has a new blog called "Voice From the Holler." His first post is called "Coming Out: A Redneck Confession." You may find it both entertaining and enlightening. Congo is one of the most desperate and war-torn places on earth. This video by Rolland Baker of Iris Ministries is really worth watching. Amazing stuff. I've been thinking about the framing of the so-called Wesleyan Quadrilateral in the Book of Discipline. Scripture is primary, revealing the Word of God "so far as it is necessary for our salvation." Therefore, our theological task, in both its critical and constructive aspects, focuses on disciplined study of the Bible. To aid his study of the Bible and deepen his understanding of faith, Wesley drew on Christian tradition, in particular the Patristic writings, the ecumenical creeds, the teachings of the Reformers, and the literature of contemporary spirituality. Thus, tradition provides both a source and a measure of authentic Christian witness, though its authority derives from its faithfulness to the biblical message. What's interesting about this is that it essentially reverses the role of scripture during the period of canonization. Scripture was used to teach the faith of the church, a faith one could locate in various forms of the Rule of Faith. So, in that setting, the Rule of Faith (tradition) was primary, and Scripture illumined the doctrinal claims one found in the Rule of Faith. Works that were thought useful for teaching the faith of the Church in Christian liturgy were eventually canonized. Works that did not teach of the faith of the Church did not make it into the canon. I don't dispute that the above statement from the Discipline captures Wesley's perspective, but did Wesley have it right? Would it be right to say that our faith is revealed in tradition and illumined by scripture? And if Wesley didn't have it right, can we dispense with the Quadrilateral? At a church-related conference, I heard a presentation on the matter of stigmatization as it relates to people with disabilities. The primary point of the presentation was that we tend to internalize negative perceptions by others, and thereby allow them to control our self-esteem and consequently our behavior. All true enough…. Nevertheless, when it comes to stigmatization, there is another exceedingly important issue for the church: the need to challenge perceptions and attitudes that result in stigmas. We Christians are to be transformed by the renewing of our minds (Rom 12:2). This means, in part, that we learn to see the world around us differently. Specifically with regard to people with disabilities, part of what this means is that we learn to see people as God sees them—not as “disabled” or “able-bodied” or “able-minded,” but as God’s good creation, in need of Christ’s redemption, with gifts to share in service to the body of Christ. The church can help to deal with the issue of stigmatization first by teaching people the proper way to view other people. Another way of saying this is to say that we must teach a clear and faithful theological anthropology. Second, we have the capacity and responsibility to introduce people to the Holy Spirit who renews the minds of the faithful. God heals us of sinful ways of viewing and relating to one another. Only in these ways will we ever get at the root causes of stigmatization that causes so much pain in the lives of people with disabilities. Cambridge has just published a fine new volume edited by my friend and colleague, Jason Vickers. 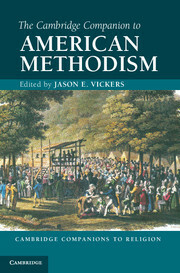 The Cambridge Companion to American Methodism features articles by an array of excellent scholars, including Ted Campbell, Dennis Dickerson, and United Theological Seminary President Wendy Deichmann. This is one that needs to be in the library of any Methodist/Wesleyan pastor, professor, or interested layperson. Hey UM's.... Is your annual conference on board with this decision of the 2012 General Conference? Each Conference shall designate that at least one Annual Conference session during the 2013-2016 quadrennium will have a theme centered on Disability Awareness to set an example for each District and Local Church. Resources and guidance are available from the Committee on Disability Ministries (currently the United Methodist Task Force on Disability Ministries – see separate petition for name change) and UMCOR Health/Health and Welfare Ministries. Is your annual conference doing anything along these lines? I haven't heard a great deal about this in the wider church.